Thank you, Jaqui, for introducing this writer I did not know at all. I love Russian writing so will definitely read. You are most welcome – I’m very glad to have introduced you to this wonderful writer. 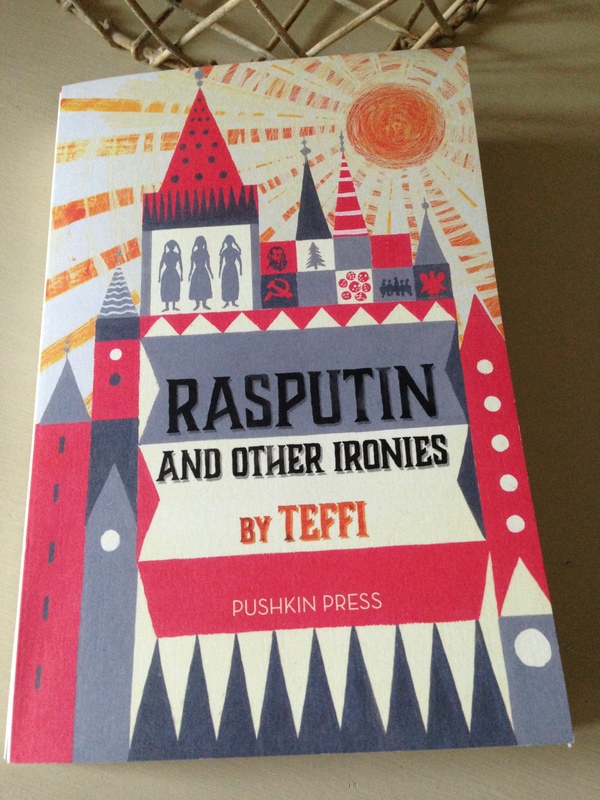 If you love Russian literature, then you’re sure to enjoy Teffi. She is a real gem. Great review, Jacqui. These pieces sound extraordinary – vivid insights into Russian life of the period. Thanks, Susan. Yes, the links to Teffi’s life make these pieces all the more fascinating. Vivid insights indeed. Thanks, Jacqui. This collection sounds fascinating. Very welcome, Julie. It is. Teffi is quite a writer – I’m so glad I discovered her. The fact that Teffi had encounters with what can be described as monumental historical figures adds interest, However, it seems, based on your commentary, that there is a lot more to the collection then that. I often find Stories within stories enjoyable. It is not so easy for a writer to incorporate them within a short story or short essay format. The pieces covering her encounters with Rasputin and Lenin are two of the highlights for sure, but (as you’ve noted in your comments) there’s a lot more to Teffi than these vignettes. Her range is so impressive. Some of her stories and non-fiction pieces are satirical and insightful; others are more wistful and melancholy. In fact, the diversity is one of the things I like most about her writing. I hope you get a chance to read her one day Brian. I think you’d really appreciate her. Thanks for the mention Jacqui! Yes, Teffi is wonderful, and I think you’ve really captured her appeal here – great review as always! You’re welcome, Karen. I’m looking forward to reading Memories at some point, hopefully later in the year. What a wonderful glimpse into another world. Would be interesting reading this in counterpoint to the work Russian poet, Anna Akhmatova. Thanks, Jacqui! Dazzling and powerful, her masterwork “Requiem” is harrowing. For many years, the poem was “held” in the memory of Akhmatova and a few close confidantes, as even putting it to paper would have been very dangerous in the political climate. Ah, I see! Yes, a fascinating contrast between the paths of these two Russian writers – that’s such a poignant quote about living one’s own life. When I looked her up on wiki, I noticed the references to censorship and the methods these writers used to preserve their work. Quite ingenious really, but it’s a tragedy to think that some of Akhmatova’s work was almost certainly lost along the way. I shall have to seek her out – many thanks once again. I remember reading Karen’s review of this book. It really sounds a fascinating collection of pieces bringing together many different experiences of Teffi. Wonderful review. It is indeed a fascinating collection, all the more so for the diversity of pieces included here. Teffi seems to have lived many lives, all of them intriguing in their own way. Pushkin publishes such great stuff! I love how you give a bit about this fascinating sounding author’s life. It sounds like Teffi might have been around Paris at the same time Jean Rhys first got there! I wonder if they ever met! It sounds like a really fascinating and varied group of stories, particularly the encounters with other writers/artists. I’ll have to read her at some point. Don’t they just! They are a veritable treasure trove of literary riches. You know, I hadn’t thought about a possible connection between Teffi and Rhys (there’s no mention of JR in any of the pieces here), but it’s a tantalising prospect. Teffi was quite well known among the writers on the émigré scene in Paris at the time, so it’s possible. Class differences may have prevented it, though. Back in St Petersburg, Teffi’s family were quite privileged, and I get the feeling that she moved in fairly well-to-do circles in Paris too. There’s a memoir which I haven’t read yet, Memories: From Moscow to the Black Sea, but I think it focuses on her journey to exile as opposed to her time in Paris. I would definitely recommend you give her a try at some point. She is such a brilliant writer, and I’m sure you would enjoy her work. Well, if you like Russian literature, then Teffi is the woman for you. She was quite the literary star in her day. Both of these collections are excellent, but if I had to suggest one as an introduction to her work, then I would recommend Subtly Worded. It contains a mix of short stories together with pieces inspired by experiences in Teffi’s life (including her account of those encounters with Rasputin). I hope you decide to give Teffi a try at some point. This was my first Teffi book and I fell I love with her writing! I also bought Memories and Subtly Worded and am looking forward to them both. My favorite story in the collection was the one where she sees right through Rasputin’s little act and she is not impressed with him. She was so astute and clever! I’m not surprised you fell in love with her writing, Melissa. She is a marvel, one of my favourite discoveries in recent years. Yes, I loved her account of those meeting with Rasputin too. She was so sharp and insightful. Just the way she resisted the lure of his charms – it was very impressive! Subtly Worded is terrific, and I’m sure you will enjoy it too, Memories sounds a little different to the other two. More melancholy and poignant, I suspect…but a necessary part of Teffi’s journey in life. What a life she led – and what a great writer! The pieces you’ve pulled out are wonderful. i’ve not read any Teffi but I will definitely seek her out now. Yes, she was a wonderful writer, and the pieces in this collection give a real insight into several different aspects of her life. She is well worth seeking out – I hope you get a chance to read her one day! After reading Memories, I know I’d enjoy this. It’s bizarre to think that her fans included the Tsar and Lenin. Isn’t it? And Rasputin took quite a fancy to her too. Yes, I’m sure you’ll enjoy this collection, Guy. Funnily enough, the Merezhkovskys (who feature in one of the pieces about other writers) reminded me a little of the Merzes from Sybille Bedford’s A Legacy. They sort of operated in their own world complete with its various eccentricities (especially as far as money and other people were concerned). I read about the range of Teffi products. I couldn’t help but wonder if this was one of the earliest instances of celebrity product branding. I really liked A Legacy. The Merzes were like museum pieces. Yes, you’re right about the celebrity product branding – I remember reading about that somewhere too. There was a Teffi perfume (and some Teffi sweets, I believe). Quite remarkable when you think about about it! I loved the Merzes from A Legacy, too. Museum pieces is spot-on – they were like relics from another age. Bedford’s prose was somewhat challenging at times, but her characterisation was excellent. I ended up buying another Bedford off the back of a recommendation from Ian Curtin – Jigsaw. It sort of picks up from the point in time at which A Legacy ends, but I’m not sure if the characters are the same. Possibly not, although it’s still semi-autobiographical as far as I can tell from the description. I agree–the writing isn’t the easiest w/ Bedford–obviously someone who didn’t attend writing workshops and an MFA programme. But that can be good. I’d describe Bedford’s writing style as a bit wooly. Yes, I agree – that can be refreshing. In spite of her somewhat oblique style, Bedford is definitely worth persevering with. I’m sufficiently intrigued by her to want to read more. I hope I get a copy of this with my Pushkin subs! Oh, I hope so too, Lisa. Seeing as Pushkin have published three books by Teffi, there’s a good chance that at least one of them will be included in your subscription. Thanks, Poppy. Excellent news – Teffi’s ideal for #WITMonth. Are you planning to read Subtly Worded? I think it would make an excellent intro to her work as it contains the Rasputin and Tolstoy pieces included here, plus a varied selection of her short stories. Many thanks for sharing my review – much appreciated!